Thought you were doomed to using plastic plants in low-light? Look no further! If you need something that doesn't require you to invest in lighting (and electricity! ), these seven genera of low-light plants are for you! Anubias – an easy flowering plant that can be grown submersed or emersed, this genus is great for attaching to driftwood and rocks. We recommend Anubias barteri variations barteri, nana, nana petite and coffeefolia. Java ferns – a staple in the hobby, java fern is nearly impossible to go wrong with and will sprout babies as long as it’s in water! Microsorium pterpus comes in several variations, all great choices – standard, narrow leaf, windelov and (if you can find it) trident. Crypts – as the name suggests, this genus is a hidden club. Cryptocoryne will flourish is low-light and comes in a variety of looks. Cryptocoryne petchii, pontederiifolia and wendtii are low maintenance, but if you’re looking for a challenge, balansaeand retrospiralis are our favorites! 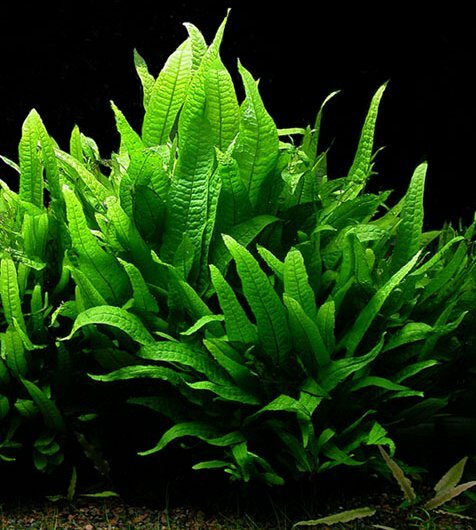 Vallisneria – a must-have background plant for the low-light aquarium. Two species will flourish in your tank – americana gigante (jungle val) and asiatica biwaensis (corkscrew val) will both fill up that negative space. Egergia – densa, commonly known as anacharis, can’t be stopped. If you’re not looking to constantly be trimming and rehoming your plants, najas (Narrow Leaf Elodea) is a good alternative with subdued lighting. Creeping Jenny – Lysimachia nummularia ‘Aurea' will grow submersed or emersed and is very hardy. Swords – a lot of Echinodorus will survive but not flourish in a low-light setup. But, if you’re looking for something that will grow thick, look no further than parviflorus var tropica! No matter your taste, there’s plenty of variety for your low-light setup. Whether you stick to the basics or spice it up, your fish will love it!